Of the approximately seven million Palestinian refugees around the world, more than 650,000 are living in camps along the West Bank and Gaza Strip. Unfortunately, due to sales rights restrictions, we cannot offer Behind The Wall for sale in your country. Of the approximately seven million Palestinian refugees around the world, more than 650,000 are living in camps along the West Bank and Gaza Strip. Having been forced from their homes, either through violence or the threat of it, those living in these camps, Rich Wiles asserts, suffer greatly from Israeli Army incursions, violence, poverty, and desperation—often even more severely than in the surrounding cities or villages. Although much media attention has been drawn to the area's political climate, the stories of its dispossessed people have gone largely underreported. Having spent much of his time in Palestine since 2003, Wiles offers a glimpse inside the West Bank's refugee camps between 2006 and 2007 through a collection of oral histories, vignettes, and photographic portraits. 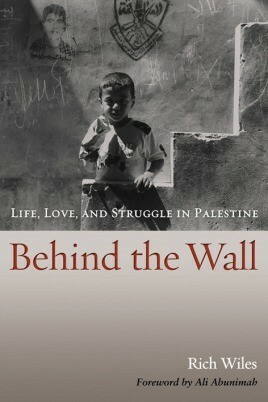 In these pieces, Wiles recounts conversations with Palestinians of all ages, including survivors of al-Nakba, released child and female prisoners, parents trying to rear their children amid the violence of military occupation, and exiles struggling for the right of return to their original villages. These intimate portrayals not only offer clues to understanding the physical and psychological effects of exile, colonization, and occupation, they also reveal the true Palestinian psyche, one that is at once full of life, love, and strength. Through both written word and photographic image, Behind the Wall allows Palestinians to speak for themselves.